Sharmin Sadequee is a faculty member and teaches anthropology in the City University of New York system. Her current research examines court litigations and the broader counter-terrorism policies and practices affecting Muslims in the US. Her studies also include the ways Muslim Americans address post-9/11 government overreach through social movements. This essay by Sharmin Sadequee is an abridged version of the author's journal article that appeared in Surveillance & Society (Vol.16. No. 4; 2018). In Trump v. Hawaii (2018), the United States Supreme Court upheld the Trump administration’s broad travel restrictions targeting the citizens of several Muslim-majority countries. Numerous Muslim Americans and social justice advocates were outraged by this court decision, arguing that the travel restrictions were motivated by religious prejudice and therefore violated the principle of religious freedom. This opposition and outcry from social justice communities against state repression continues the previous resistanceactsagainst government profiling, preemptive prosecution, and unjust imprisonment of Muslims, and against the corresponding rise of hate crimesagainst Muslims that has been enabled by widespread social prejudice and Islamophobia. Many advocacy groups have also opposed the government’s “Countering Violent Extremism” (CVE) programs, which allow for the government surveillance of Muslim American communities and targeted interventions in religious teachings. Concerns about the religious freedom of Muslim Americans have been ongoing since the beginning of the “War on Terror.” Prosecution of Muslims in government-manufactured terrorism plots is one area where challenges to constitutionally protected rights and freedoms continue to be debated, but, following the decision in Trump v. Hawaii,similar political doctrines and secular values of liberalism have become the main concern of Muslim Americans and rights advocacy movements. These movements resist state violence and white supremacy, and they advocate for Muslims’ rights to religious freedom, equality under the law, and incorporation in Western, liberal democracies. I have been directly involved in these advocacy efforts as a result of the preemptive prosecution of a family member, as a former program director of a national civil liberties organization, and through my studies of the intersections of law and religion. As a result, I have come to question whether or not many of our social justice platforms calling for religious freedom and pre-9/11 constitutional standards by invoking principles and values of liberalism supports freedom of religion or actually serve to curtail the scope of religious practice. In the name of protecting values and doctrines of individual autonomy and rights that are central for the maintenance of the political culture of liberalism, these advocacy efforts often simply reinforce the power of the secular state, albeit unintentionally, to judge between “acceptable” and “unacceptable” religious practice. In the following sections I will raise questions about some of these assumptions, normative views, and values in the discourses and platforms prevalent in Muslim American social justice movements countering government overreach as evidenced in the current anti-CVE and No Muslim Ban efforts. I believe there is a need for drastic reconsideration and reformulation of what religious freedom actually means in American liberalism in particular and, more broadly, in a modern securitized and militarized democratic state. “Countering Violent Extremism” (CVE) programs were first initiated in the United States by the Obama Administration. The goal of these programs was to use “soft power” and community interventions to dissuade individuals from mobilizing toward militancy. While they were, in theory, broad-spectrum initiatives that would apply to any “extremist” political group, in practice CVE programs were targeted almost exclusively at Muslim Americans. The Trump Administration made this focus explicit by indicating that CVE programs would only be applied to Islam. The purpose of CVE initiatives is to involve local community members and service providers, such as teachers, and healthcare professionals, and religious leaders, to identify and re-educate individuals who are perceived to be moving toward “extremist” or “radical” outlooks and to reintegrate these individuals into the mainstream society. 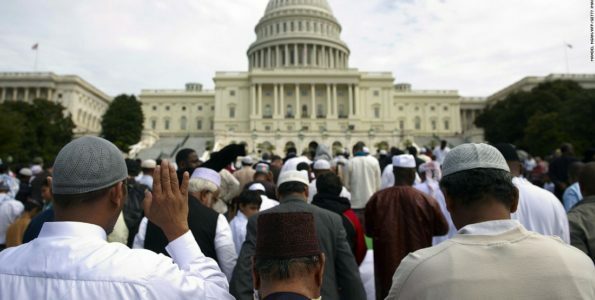 While this may seem at first glance to be a noble and proactive approach to protect the public, many Muslim American leaders and civil rights organizations have come to feel that CVE programs promote anti-Muslim animus and racial discrimination. Both pro- and anti-CVE advocates express a strong belief in the normative principles of secularism and liberalism concerning individual autonomy to religious freedom as described in the US Constitution. To protect these moral values and principles, supporters have proposed community-led CVE programs, in which Muslims retain control over religious matters and simply assist government agents in preventing and investigating criminal activity. However, the potential for government influence in religious practices and views during the implementation of such programs is still profound. According to anti-CVE groups, these programs do not have a coherent definition of or consistent process for identifying “extremist” behavior. They also point out that exclusively targeting Muslim Americans while ignoring other groups, such as white supremacists, whose members have also committed political violence demonstrates blatant religious prejudice. For many critics, then, CVE programs appear to be a clear violation of the secular principle of separation of church and the state. 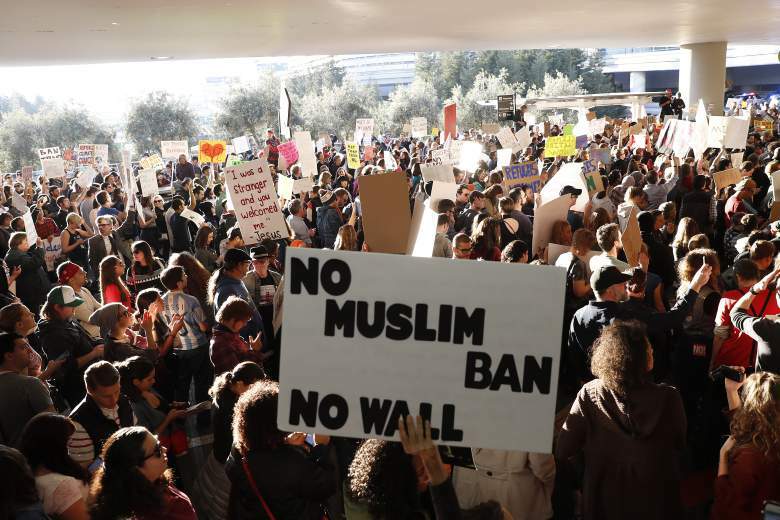 When the Trump Administration issued an executive order that aimed to close America’s borders to refugees and citizens from certain Muslim-majority countries, opponents started the movement that became known as #NoMuslimBan. Thousands of people organized collective actions across the country to protest this bigotry. 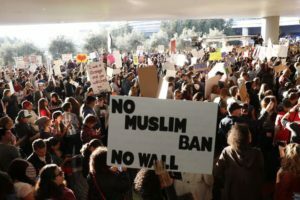 Civil rights organizations challenged the order in numerous states, and some federal courts temporarily halted deportations so that legal challenges could proceed. Similar to the opposition against CVE programs, most #NoMuslimBan advocacy efforts centered their challenges to the administration’s actions around constitutional protections of religious liberty. The strongest claim against the executive order has been that the government is expending resources in a way that favors individuals of one religious persuasion (i.e., Christian immigrants) over another (Muslim immigrants). Trump’s political statements expressing categorical hostility toward Muslims and Islam were brought up in these court cases as evidence that the travel restrictions are based on religious prejudice. As rights and liberties advocacy movements in a secular democracy, anti-CVE and No Muslim Ban campaigns operate with certain assumptions about the constitutional rule of law and normative claims about the role of secular authority in modern nation-states. Perhaps one of the most fundamental arguments of these movements is that if entities of the state (government authorities, judges, law-enforcement agencies, etc.) support one religion or a specific religious interpretation over another, then the state has become unacceptably entwined with religion. In the case of the anti-CVE movement, advocates claim that the government should not promote what it considers to be a “good” or moderate/liberal interpretation of Islam. In the case of the #NoMuslimBan movement, the argument is that the Trump Administration is privileging some religious groups at the expense of others. Nearly all such social justice movements strongly believe that the government needs to remain secular and neutral. However, I would argue that the culture of liberal secularism, and its associated laws and politics, have never been religiously neutral.In their critique and analysis of secularism and liberalism, the anthropologists Talal Asad, Saba Mahmood, and others have demonstrated that the political doctrines of separation of church and state and autonomous religious freedom emerged from a particular context in sixteenth and seventeenth century European history, when many European states dissociated themselves from the rule of the Catholic Church and actively promoted Protestant Christianity. These early-modern states became liberal and secular and established representative government in a way that followed the concepts of human nature, natural law, and morality that had become prevalent in Latin Christendom. In concert with Protestant views of religion as a private matter of individual conscience, the newly secular societies relegated religion to the private sphere and upheld the freedom to define one’s own beliefs as a fundamental right. Seen in this way, the modern democratic articulation of the separation between religion and government was shaped by a specific transformation within Christian Europe, which dovetailed with the rise of Protestantism and capitalism. The early-modern states that laid the foundation for what we now understand as human rights protections actively enshrined certain values, one of which was the scope of legitimate religious practice. Privatized religion that allowed for a great deal of individual autonomy and choice was considered acceptable in this moral worldview, whereas faith-traditions that did not fit this moral model (e.g., sixteenth-century Catholicism) were considered unacceptable and in violation of the secular paradigm. Thus, it can be argued that the entire political structure of liberal/secular societies rests on a Protestant moral and culturalviewpoint, in which the separation of law and politics from religionis considered a fundamental value and the freedom of the individual from religious authority is a fundamental right. Incorporated with Western colonial and capitalist expansionism of the eighteenth and nineteenth centuries, secular understanding of religion spread globally and often forcefully imposed on colonized brown and black peoples. As a result, many parts of the world adopted their own versions of secularism and surrendered public authority to the state. During this time, a proliferation of scientific studies also helped Europeans to hierarchically categorize various faith traditions and ethical systems by connecting these to racial categories and demarcating cultural and religious practices between private and public, and civilized and uncivilized. Societies that followed the secular model were considered modern and ‘human’ and those who held on to their traditions and modes of life were viewed as backward and ‘non-human.’ The combination of Euro-American colonization, modernization, and neoliberal globalization have helped shape people’s understanding of Islam (and other traditions) based on the Protestant concept of religion instead of the categories and definitions that are native to diverse faiths and ethical systems. As the anthropologist of law and religion Winnifred Sullivan who analyzed contemporary US laws and politics in her book The Impossibility of Religious Freedom points out, American secular society operates under a Protestant-affiliated ethos that does not aim to create equality between religious communities but rather to sort out “good” religion from “bad” religion. The main part of this presumptuous distinction is that “good” religion remains private and invisible, whereas “bad” religion is connected to visible expression and authority. These concerns have been reflected in many court decisions where justices have struggled to navigate between religious liberty and other constitutional rights concerns. Believers often claim the personal right to be “exempted” from various laws and policies that interfere with their religious and cultural practices. However, courts have to balance individual claims with the values of a larger dominant society reflected in the same constitutional laws. One of the first times that the Supreme Court addressed this question was in a series of cases involving nineteenth-century laws aimed at suppressing the practice of polygamy by members of the Church of Jesus Christ of Latter-day Saints. In Reynolds v. United States (1878), the Court rejected a “free exercise of religion” challenge against anti-polygamy laws, notably holding that the Free Exercise Clause of the Constitution protects beliefs but not conduct. In other words, while the government cannot interfere with personally held religious beliefs and opinions, it may interfere with practitioners’ outward expressions and conducts. The court stated that allowing unfettered freedom of religious practice to all faith-traditions would, in effect, make any professed doctrine of belief superior to the law of the land, thus permitting every citizen to concoct their own laws at whim. That is, if each person demanded religious (and cultural) exemptions from the law, then the law (and the state) would be powerless. Instead, faith communities are expected to change their values and behaviors so they conform to the law of the land to sustain the integrity of liberalism. Since the decision in Reynolds,a patchwork of court decisions, including cases concerning Muslims, has provided the framework to determine the circumstances under which an individual may or may not claim a religious exemption from a legal requirement. During the 1990s, controversy over religious freedoms prompted Congress to pass legislation emphasizing that religious exceptions should be granted unless the government can show that the law in question is the “least restrictive means” of furthering a “compelling governmental interest” (see RFRA and RLUIPA). Despite these modifications, courts have always actually functioned to protect secular power and paradigm. For most Americans, freedom of religion is a taken-for-granted part of a free, modern democratic society where citizens have equal rights to individual choice of religion and religious practices. However, what the ongoing “religious freedom” litigations in the US demonstrate is that faith-based individuals and communities have to ask for permission from secular state authorities to practice their choice of faith-tradition. These court disputes also provethat the freedom to practice one’s own religion is not usually based on the criteria of one’s religion but the standards set by the secular state. That is, the right to religious freedom is largely limited to individual, autonomousbeliefs that do not interfere with the broader secular paradigm and political culture of liberalism. Thus, it would not be an exaggeration to say that the United States has a particularand biased outlook on what types of religion and religious practices are legitimate. It can also be said that the secular principles of separation of church and state and free exercise of religion in pluralistic societies don’t actually mean that all types of religious expression are permissible; in fact, they are specifically intended to limit outward religious expressions and keep religion out of the public sphere. Faiths that do not adhere to the secular principle of individualized spirituality are not legal or protected under this paradigm. Faith-based communities in the United States are prompted to conform to this hegemonic monolithic secular paradigm. As a result of this secular morality policing, American secularism is unable to embrace pluralities of faith-based ethical values and expressions. Social justice movements advocating against state involvement in religion are ultimately confirming the secular principles of autonomy and individualism of American liberalism and reinforcing the religious biases and constraints of secular/liberal democracies on practitioners of Islam. As products of modern nation-states, such advocacy efforts advance a myth of religious “neutrality” that does not actually resist the government’s overarching authority to distinguish between acceptable and unacceptable religions. Instead, these platforms may paradoxically endorse and authorize the secular power to target and limit the religious expressions and ethics of Muslims and help construct secularized Islam in America — an American Islam. This contradiction does not, however, communicate weaknesses of advocacy efforts but reveals the inflexibility and tyrannical characteristics of modern secular democracies that, sometimes forcibly, conform diverse faith-based and other ethniccommunities to the secular/Protestant monoculturemodel with the force of laws and regulations such as surveillance, CVE, and counter-terrorism and other security measures. Secularism/liberalism is part of Euro-American imperial and capitalist expansionism and whiteness; therefore, a re-evaluation of what “pluralism” means in this authoritarian American secular structure is urgently needed. The decolonization of ethical value systems, perhaps, also necessary to reconfigure the meaning of “religious freedom” and justice for Muslims and all faith communities in this country so that the United States can truly become a modern, pluralistic, and progressive society.